Saturday evening we held a birthday party for my husband. At 8 pm we turned out all the lights and visited by candlelight. The flickering shadows and soft light gave a different air to the gathering. It's good to remind ourselves to care for the world. I'm back after a more than hectic week. My grandmother (91) died on Easter Sunday after taking a fall the Tuesday before. She was active and alert until then. The funeral was Wednesday. I wrote and delivered the tribute on behalf of her 32 grandchildren - a privilege for me to honour this gracious, godly woman. We also had guests for the entire week. Good friends we knew in Ecuador. Our time with them was wonderful - reminiscing, laughing, eating and just sharing our lives. Our weather has been most capricious - snow, hail, sun, rain, clouds - all in the space of an hour. It's crazy! This is the winter that won't quit. It's no secret that blue is my favourite colour. And I do love these irises, delicately formed on long green stems. A bit of spring indoors. We're having a lovely time with friends. Yesterday, predicted to be the best day of the week, we sailed a couple of hours to Pender Island. The wind was gusty and we made great progress under sail, which is so lovely and quiet compared to motoring. It was chilly but I'd brought along blankets and so we stayed reasonably warm. Lunch in the dining room of the resort at Poet's Cove provided sustenance and then...we soaked in the hot tub and thoroughly warmed our bones for the sail back. The return trip was bright and sunny with diamonds sparkling off the waters. A gorgeous day! May the new and wonderful life promised by Christ be yours with joy! When I think of months in terms of colour - green is what comes to mind for March. And apparently I'm not the only one. Angela is asking people to post pictures of green things on their blogs. Check out her blog for more green sightings in a day or two. I realized that I don't have a lot of green in my house - I'm not quite sure why not. Perhaps it's because I'm so infatuated with blue and white and yellow. One of my favourite green things - a glass fishing ball I found on the beach near Jordan River (on the west coast of Vancouver Island.) It looks pretty in my garden year round. Green in the garden...hyacinths blooming and smelling wonderful! This is as green as it gets in my house, other than plants. I recently redid my guest room. The walls are still blue but the curtains and accents are this lovely light teal green. With all the painting and cleaning going on around here, there's not been much time to create. Although cleaning is a type of creating, don't you think? Creating order out of chaos is very satisfying. I made a pillow similar to this one in January, sort of Valentine-ish. You can see it here. I didn't have anywhere to put it and it got plopped onto the chair in the front hallway. I liked it there and thought, "I should make one for each month of the year." Well, it might happen, it might not. But I did finish this spring version. Today I'm cleaning house and getting ready for a week of company. Church tonight to commemorate Good Friday. Remember. Be thankful. Live joyfully. Part two of the archive meme is about friends. I am so blessed with friends of all kinds, from those with whom I share my deepest feelings to more casual relationships. When we lived overseas, friends became the family I missed and those friends, scattered around the world, are still dear today. My family members are also my friends. My daughters are my best friends. But throughout my family, my mother, sister, mother-in-law and sisters-in-law share similarities and differences that we all appreciate about each other. And I've met some wonderful new friends during this blogging journey. Inspiring, like-minded, generous women with whom I can say along with C.S. Lewis, "What! You, too? Thought I was the only one." I have this bit of spring inspiration in my dining room. I love the green birds which I found recently. Hope is one of Easter's hallmarks. Hope for this life and the next. See the ring on my son's pinkie finger? It's an iron ring and it symbolizes an engineer's obligation to society. The ring is given as part of the Ritual of the Calling of an Engineer. The Obligation which is part of the ceremony is written by Rudyard Kipling in 1923 specifically for the Canadian Engineering profession and the language is beautiful. Although the ceremony is attended only by engineers (count me out!) I read the obligation afterwards at the reception. This is a huge milestone for Travis - and we're so proud of him. When he was 10 he was struck by a car and suffered a severe brain trauma. While he was in a coma, we asked the doctors what the prognosis might be. They weren't terribly encouraging, but also said that they just couldn't tell. "But we can tell you that he won't be doing calculus." Ha, we all laughed, not really caring about calculus at that point. We trusted God to heal Travis and He did - far beyond what we could hope. Calculus is Travis' best subject - he gets straight A's. And now he's a computer engineer. We are so grateful! Christi tagged me for an archive blog. I'm going to divide it into 5 separate posts. So here's the first one...Family. I've not blogged much about my family for privacy's sake. 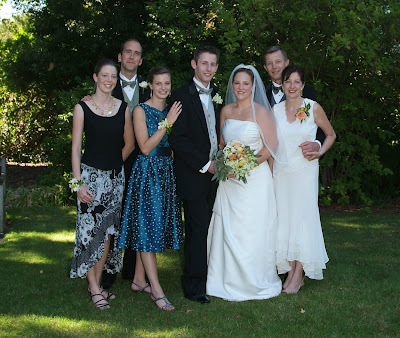 But here's a photo of the 7 of us taken at my son's wedding 19 months ago. My husband, Tim, and I have three wonderful children. Our eldest daughter is married to an engineering technologist. She teaches high school English. Our son is completing his computer engineering degree this year and his wife works for the provincial government. Our youngest is finishing her degree in Linguistics this spring. She says she doesn't want to marry anyone associated with engineering! We raised our children in South America - they were all born there. We returned to Canada 6 years ago. We're very close and the dearest times I spend are with my family. God has blessed us so much with them and with our marriage. My husband is my closest friend, the person with whom I laugh, cry, pray and play. I love to cook dinner for my family, to sit around the table with them and to hear them talk. We play games together - well, the youngest and my husband don't enjoy that, so they do the dishes while the rest of us play games. Last summer we bought a sailboat, along with two other couples. We enjoyed getting out on the water with the children. When we did overnight trips, some camped on land as sleeping 7 on the boat would have been very crowded. We enjoy the outdoors - hiking and exploring some of God's beautiful creation in this part of the world. I'll carry on with friends next time. Link 3 must be about yourself, who you are… what you’re all about. Link 4 must be about something you love. I think this is a great way to circulate some of the great older posts everyone has written, return to a few great places in our memories and also learn a little something about ourselves and each other that we may not know. Post your five links and then tag five other people. At least TWO of the people you tag must be newer acquaintances so that you get to know each other better….and don’t forget to read the archive posts and leave comments! Doors hold fascination. Secrets of all kinds linger behind doors - unknown worlds to be explored. Britt has a beautiful post on doorways. Here are a few of my own. In Avignon, I looked down from a park and saw this tower and doorway. The only direction to go is down, curving around the stairs that follow the tower construction. Round and round, down and down. A doorway for escape. But Marie Antoinette did not escape for long. This door leads from her bedroom in Versailles and it is through here that she fled from the angry crowd. I like the fact that the door still holds signs of the hundreds or thousands of hands that touched it. "Keep out," says this iron grill in Sevilla, Spain. But at the same time it tantalizes with glimpses of the cool garden and fountain beyond. A paradox. Inviting and detracting all at once. Moorish architecture found in Sevilla contains beautiful arches and intricate detail. What's cheerier than a daffodil on a grey day? Kari and Kijsa are hosting a spring blessings gathering. Hop on over to see the other posters. Neat and tidy. I'm in the process of sorting and cleaning out closets. I love opening the door and finding things in order. It might not look like the pictures in magazines - blankets, sheets and towels collected through the years don't have a cohesive theme. Today I'm working on my studio/office - actually, it's taking about 3 days. I keep stopping to watch bits of Lost - my daughter had her wisdom teeth out and rented the entire first season. I'm finding it rather captivating.